1. When they taught us about forgiveness. 2. When Calvin called Susie a “booger-brain” and made her cry. Damnit, Susie. This hits too close to home. 3. When they realized the futility of war. 4. When Calvin thought Hobbes had been robbed from his home. Even though he obviously finds Hobbes, the look of sheer panic on Calvin’s face still makes my heart drop. 5. 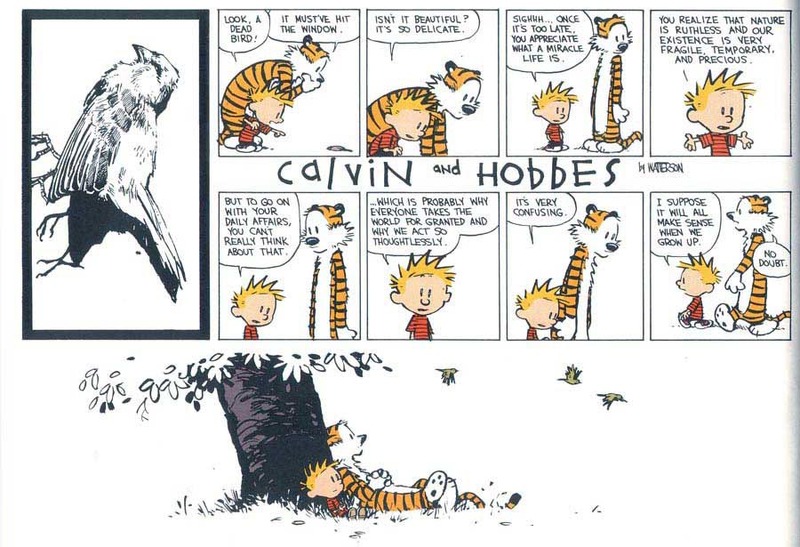 When they found a dead bird, and thought they would understand the world better when they grew up. As we all know, we never understand, but it’s nice to think that one day we will. 8. … And then when they dealt with it. 9. When a big dog stole Hobbes, and Susie found him. 10. When it all ended. Tagged calvin and hobbes, cartoons, classic, funny. Bookmark the permalink.